wheremmsgather: I am a mutt nut or is that Imamuttnut? Monday already? Wow, those weekends go by much too fast! I hope yours was enjoyable. My sweet husband spoiled me on Mother's Day by cooking all of our meals and letting me play in my stamp room! He's a keeper! 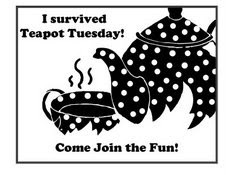 My card is for the weekly Cheers & Challenges Eager Eight (CCEE)challenge I do every Monday with my CCEE Stamper friends. 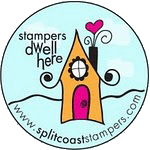 This week the challenge is for our monthly CNFS (Creative Name Featured Stamper) challenge, where someone selects an interesting user name of someone from Splitcoaststampers (SCS) and we make our cards around that. 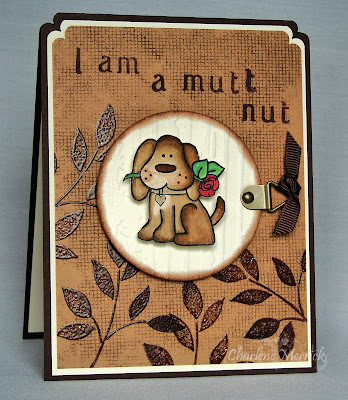 Deb (aka 88keys)is our May challenge hostess and she selected “imamuttnut” and instructed us that our card had to have a dog on it. I am so hooked on coloring with my Copic markers and, once again, used them to color this cute pooch from H&M Stamps. I've told myself that I really must dust off and use either my watercolor crayons, pencils, or chalks one of these days. Hmmmm....maybe a future challenge? I first stamped SU's Canvas background stamp onto Creamy Caramel cardstock. I clear embossed the leafy branches from SU's Best Blossoms next. I used my new alphabet/number stamps from There She Goes called A-Z and 123 for "I am a mutt nut." Jessica also sells a grid acrylic block which makes it easier to line up the letters. I embossed the circular ivory panel with the Cuttlebug distressed stripes folder and used a sponge dauber to apply Close to Cocoa to the outer edge. I finished this panel off with a piece of hodgepodge hardware and chocolate chip grossgrain ribbon! Lastly, I punched the top corners of my card with my Marvy scallop corner punch, but I often refer to it as a dimple punch because that's what it reminds me of. We'll send or cards to Laurie, aka imamuttnut, as we do for each of the CNFS stampers we choose. I love this sweet little image. The embossed leaves frame him out so nicely! what a cute, super job Charlene. Oh my GOODNESS, girl, check out that FANTASTIC....and I mean FANTASTIC...coloring! Awesome looking card!! That is priceless! I've been wandering around on ink stamp blogs today, and I'm amazed at what people come up with! 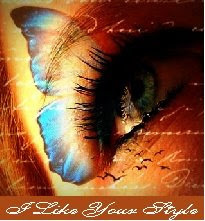 Toooo cute, Charlene...the background with the embossed leaves is gorgoeus and WOW, what awesome coloring on this!!!! Laurie is going to love this!!!! Charlene, this is one warm blooded pooch...he is colored in such warm rich colors, I can't help but love him...and the card with those letters, wowee! You did one fantastic job on this challenge card! !